Most of us don’t know about the transferring procedure of the android handsets. Moreover, wasting your precious time on saving your contacts one by one is not the best solution. However, transferring contacts is easier than you think it is. There are two prevalent ways used by most of the people for transferring their contacts from an android to another android. 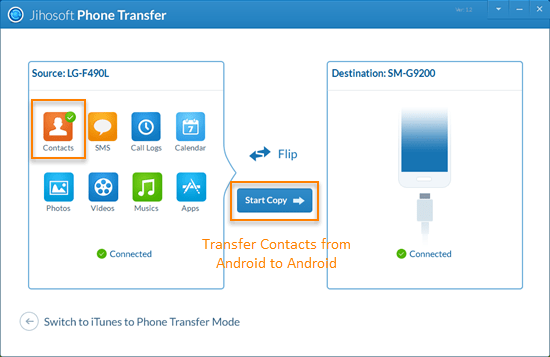 To move contacts from Android to Android via Bluetooth is the easiest method of transferring contacts. First of all, you have to make sure that Bluetooth is on and visible on both the Android Devices. Furthermore, via Wi-Fi Direct you can also copy contacts from Android to Android, the same procedure applies for this…. Yes….! Please make sure that Wi-Fi Direct is enabled on both the Android devices. Now tap on “Import/Export” > “Share name card via”, then select the contacts you want to transfer. Finally, you can tap on “Select all” to transfer all your contacts. Via Bluetooth: Now tap on “Bluetooth” and select the device to which you want to send the contacts. Then on the receiving device, accept the Bluetooth authorization request. You are done…! Via Wi-Fi Direct: Tap on “Wi-Fi Direct” and select the device to which you want to copy the contacts. Then on the receiving device, grant the permission for Wi-Fi Direct connection. That’s it….! Furthermore, there is another option for you for transferring contacts via third party app i.e. Jihosoft Android Contact Transfer is one of the most prevalent choices made by mobile users. You can use this app for contact transfer.